Let’s look back at 2018, shall we? The top three best-selling vehicles in the USA were, of course, pickup trucks. Ford, Chevrolet, and Ram continue to dominate vehicles sales with the combined force of their half-ton and heavy-duty pickup trucks. This has always been this way for decades. We often talk about thee proliferation of the SUV in this country. Last year, that has continued to dominate the market equally with the pickup truck. Families have decided that the SUV is the way to go for family transport and to fill the parking lots and garages of their place of employment. You cannot go to a shopping center without having to sift through them for an open space. Believe me, the enthusiasts are upset. Their precious coupes, sedans, convertibles, and wagons are slowly fading into oblivion. Several car lines have been cut for 2019. Woe is you. But, this is a story that is on constant repeat. The trends, the sales figures, the hatred, the love…the drama. And, we can’t talk about what’s real, can’t we? The reality is this: Toyota sold more RAV4s than any vehicle in the USA – period. It has supplanted their beloved Camry as the top draw at any showroom across this country. According to the most reliable websites – and the actual sales numbers as published in Automotive News – the Toyota RAV4 placed fourth behind Ford’s F-Series family, Chevrolet’s Silverado 1500, LD and HD, and the Ram 1500, Classic, and Heavy Duty. Fourth place! More than any other SUV and car in the USA! All 427,170 units! However, there is an interesting trend developing. There are more RAV4s sitting on dealer lots. In February, RAV4 sales dipped by 12.5 percent, while two-month sales of all Corollas edged over the RAV4’s numbers during the same period. If you think that the weather this country experienced have been responsible for this, you would think it might be the opposite. It is a head-scratching analysis, nonetheless that brings up too many questions worth answering on here. 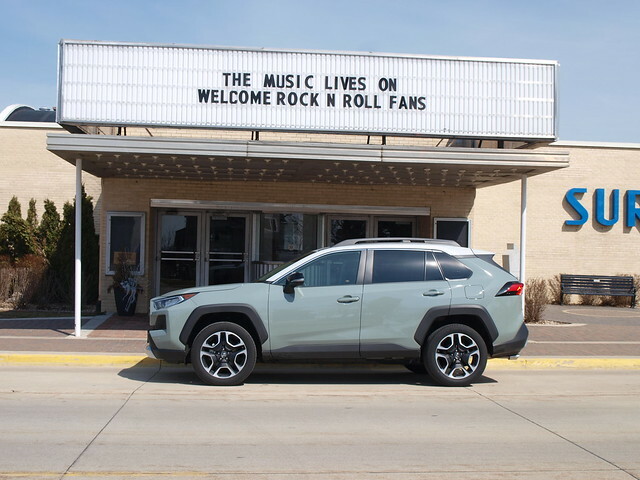 Except for one big one – the new 2019 Toyota RAV4. The new RAV4 is an all-new model based on Toyota’s New Generation Architecture. Therefore, it shares a lot more across many vehicle lines sold by the company. 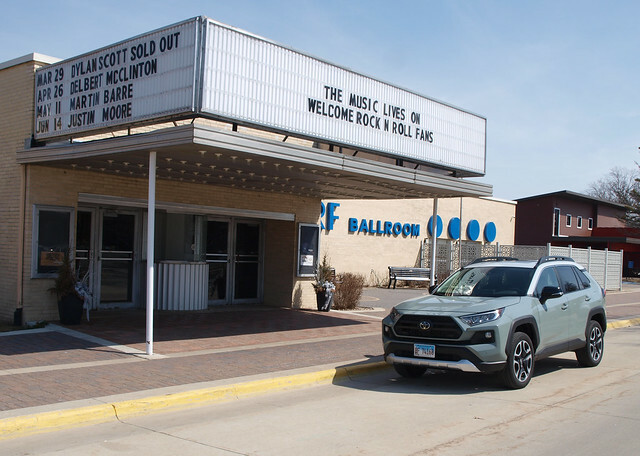 The RAV4 is also an outgrowth of a new design strategy set to engage with customers who have derided the company for producing boring looking vehicles that are quality-made, well-engineered, and highly reliable – and, that’s all. While you can see elements from other recent Toyota models on the new RAV4, it embodies its own character. The bold front end lends to a taller roof silhouette, a flatter side surface, and a strong rear end design. 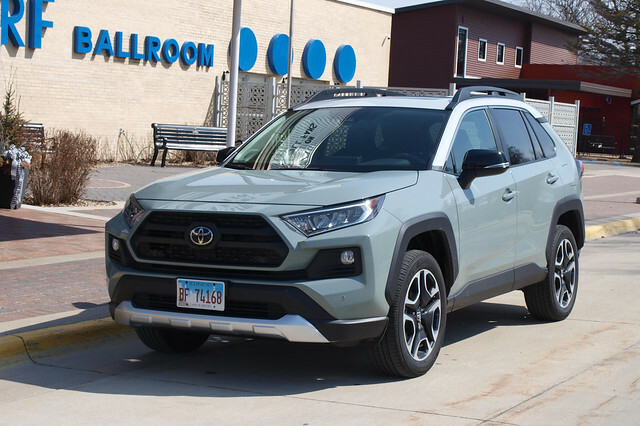 My Adventure model stood out with its own grille design apart from the rest of the RAV4 lineup and a two-tone paint job that may remind us of more rugged Toyotas of the past. Remember the FJ Cruiser? Of course you do! Stepping inside also yields a new cabin design for the RAV4 with elements from other current Toyotas. The instrument binnacle combines two side analog dial sets flanking a TFT screen that houses the speedometer and other readouts. It reminds me of the one seen on the latest Camry and Avalon. The new tablet-like infotainment pod also looks familiar. Perhaps I’ve seen it on the newest Corolla hatchback? While these elements from other Toyotas work on the RAV4, I happen to like the quality of materials and switches seen on this vehicle. You might say that Toyota took a further step to ensure that its most popular vehicle is completely on point for anyone driving one. Driving the Adventure model yields a few more features that I have never seen on any RAV4 in the past. For one, there is a Multi-terrain Select knob and associated buttons. What that tells you is the RAV4 Adventure is ready for…adventure. You can choose from Normal, Snow, Mud & Sand, and Rock & Dirt, along with an Eco and Sport button for transmission mapping. Considering the seriousness the RAV4 Adventure exhibits on the outside, you might think it could follow a 4Runner deep into the woods. 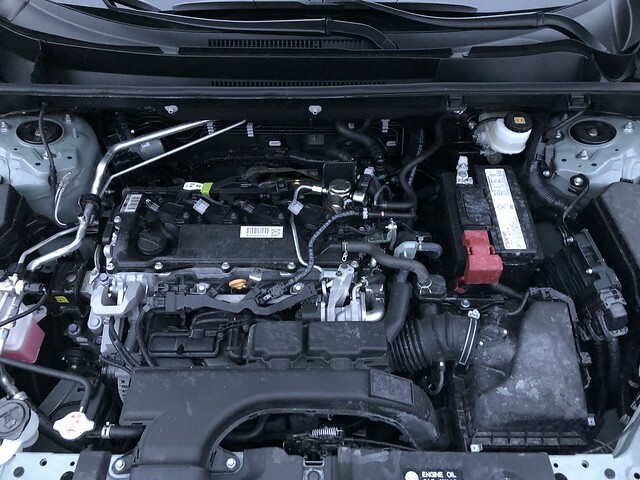 Powering my Adventure tester is a reworked 2.5-liter four-cylinder engine seen on the latest Camry. This motor now offers 203 horsepower with 184 pound-feet of torque, which is fine in traffic, getting around town and on the highway. However, it is a bit noisy and somewhat unrefined. Some folks might not like that from their four-cylinder engines. 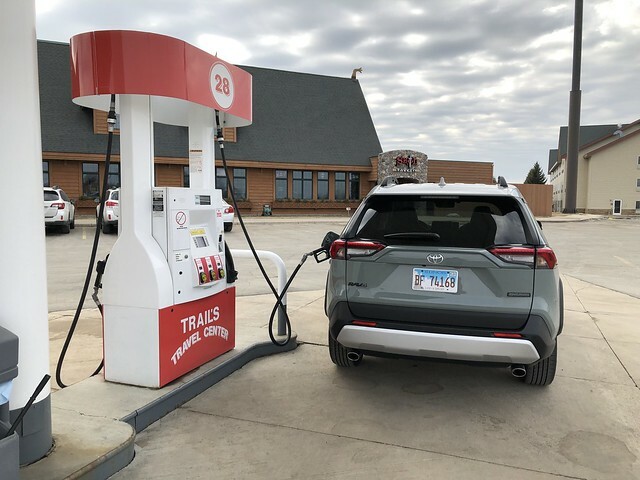 Attached to this reworked standard four-cylinder engine is a new-to-the-RAV4 8-speed automatic transmission with an all-wheel-drive system that is standard on my Adventure tester. I wished the transmission would shift further down on highway cruises, as I saw it go down to 7th gear at best on a highway stretch I took the RAV4 on. In case you’re wondering about fuel economy, I was surprised that I ended up with an average of 29.3 MPG. This has to be a record for non-hybrid SUVs in its class. If you were wondering about a Hybrid version of the newest RAV4, they are now just coming into showrooms. Combined power is up to 210 horsepower with standard all-wheel-drive across four trim levels. If you think the RAV4 Adventure is as rugged as it looks, one specification might be one to think about – ground clearance. 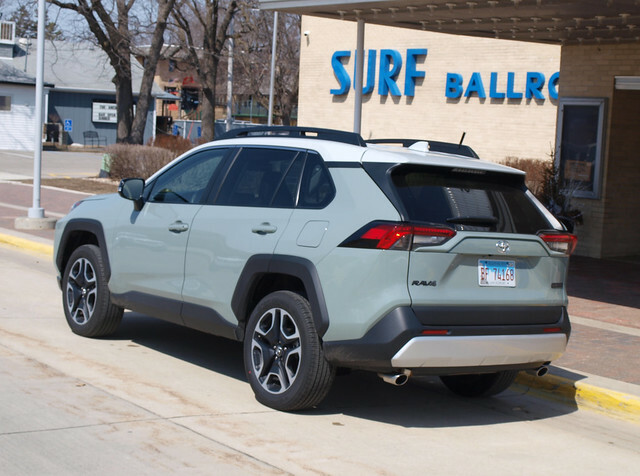 The Adventure sits 8.6 inches above the surface, about 2/10 of an inch more than the “regular” RAV4 and a half-inch above the Hybrid versions. Interesting enough, the angle of approach and departure are the same across the RAV4 lineup. If you are sizing a RAV4 up to see how it will work off-road, do some comparison with similar vehicles in its class with equal or better levels of capabilities. Though my RAV4 Adventure only showed off some designer dirt, having an inclination towards going off-road translates into a smooth ride. There is definitely some solidity underpinning this new generation SUV. In terms of handling and cornering, it is competent while yielding some roll and lean in the turns. I like the brakes on the RAV4. The pedal feel is solid and stopping power is very good in both normal and panic situations. Turning the RAV4 is quite easy with a solid turning radius and wheel response. On-center feel is also solid, though a click of the Sport mode button would weigh it down for better control. Should we talk about driver assistance technology? I know I would put some to sleep on this subject, but consumers are now putting their faith in their new vehicles in order to help improve their chances walking away from a collision. That is, if you had not picked up your phone to see what your BFF said on one of your apps about the guy you saw at the mall. If you had not picked up with phone to respond to that text, the Toyota RAV4 offers plenty of assistance features to ensure you are going to safe and secure. Toyota Safety Sense 2.0 provides the basis of a range of life and vehicle saving technologies, which now includes Road Sign Assist, Lane Tracing Assist, Full-Speed Range Dynamic Radar Cruise Control, a Pre-Collision System with Pedestrian Detection, Lane Departure Alert with Steering Assist and Road Edge Detection, and Automatic High Beams. And, yes, they work superbly! If you are interested in the new 2019 Toyota RAV4, your budget should start from $25,500. That is the base price for an LE model with front-wheel drive. My Adventure tester came with a sticker price of $39,634. In all, you have nine RAV4s to choose from, including the four Hybrids I mentioned earlier in this article. Being a sales leader can induce some pressure for the manufacturer to deliver on a product worthy of expectations based on results. 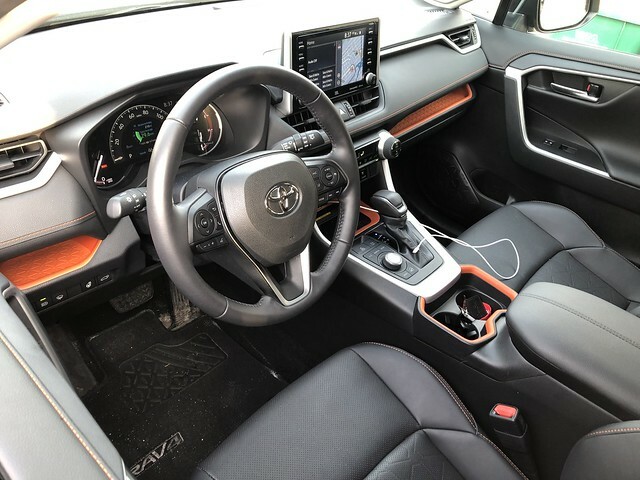 It is easy to say that, yes, the 2019 Toyota RAV4 is at the top of its class. Even more so with its new design, engineering platform, and lineup of choices for most budgets.